A majority (52%) of the nation’s 16 million Hispanic children are now “second generation,” meaning they are the U.S.-born sons or daughters of at least one foreign-born parent, typically someone who came to this country in the immigration wave from Mexico, Central America and South America that began around 1980. Some 11% of Latino children are “first generation”–meaning they themselves are foreign-born. And 37% are “third generation or higher”–meaning they are the U.S.-born children of U.S.-born parents. 43% of first-generation Latino children, 21% of those in the second generation and 5% in the third generation or higher are not fluent in English. 47% of first-generation Latino children have parents who have less than a high school education, compared with 40% of second-generation children and 16% of Latino children in the third generation or higher. 34% of first-generation Latino children live in poverty, compared with 26% of those in the second generation and 24% in the third generation or higher. 69% of first-generation Latino children live in married-couple families, compared with 73% of second-generation children and just 52% in the third generation or higher. Another characteristic that separates Latino children along generational lines is their legal status. Building on earlier research2 the Pew Hispanic Center estimates that 7% of all Hispanic children are unauthorized immigrants. But this share varies sharply by generational status. Two-thirds of the 1.7 million foreign-born Hispanic children are unauthorized, while none of the 6 million Hispanic children in the third generation or higher are unauthorized (as the U.S.-born children of U.S.-born parents, by definition they are U.S. citizens at birth). As for those in the middle–the second generation–about four-in-ten have at least one unauthorized immigrant parent and are therefore living in a family whose immigration status is legally mixed. Projects by the U.S. Census Bureau indicate that by 2025, nearly three-in-ten children in this country will be of Latino ancestry. 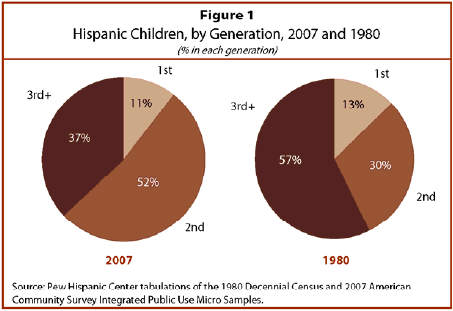 Pew Hispanic Center population projects indicate that the generational composition of Hispanic children will change yet again between now and then. Today’s large cohort of second-generation Hispanic children will eventually form families and produce third-generation offspring. The Center’s projections show that the share of Hispanic children who are second generation will likely peak not much above the current level of 52% and then begin falling roughly a decade from now. The share of Hispanic children who are third generation or higher will likely hit bottom at 35% around 2015 and then begin rising. Given past trends, this change in the generational composition of Hispanic children could well have an impact on their employment, education and social outcomes in future years. This report present findings from several existing and new Pew Hispanic Center analyses of U.S. Census Bureau data as well as Pew Hispanic Center population projections. The analysis of the legal status of Hispanic children underlying Table 1 utilized the augmented March 2008 Current Population Survey. See Passel and Cohn (2009) for further details. 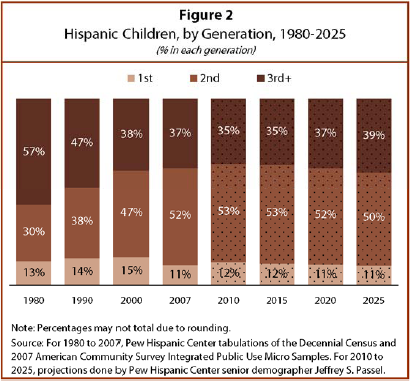 The methods and assumptions underlying the generational projections of Hispanic children from 2010 to 2025 are described in detail in Passel and Cohn (2008). The historical and current profile of Hispanic children derives from new analyses of Decennial Census and American Community Survey data. See the data appendix for further details. First: Foreign-born; an individual who is not a U.S. citizen at birth or, in other words, who is born outside the U.S., Puerto Rico or other U.S. territories and whose parents are not U.S. citizens. Second: An individual who is a U.S. citizen at birth (including people born in the United States, Puerto Rico or other U.S. territories, as well as those born elsewhere to parents who are U.S. citizens) with at least one first-generation parent. Third or higher: An individual who is a U.S. citizen at birth with both parents U.S. citizens at birth. Richard Fry and Jeffrey S. Passel. “Latino Children: A Majority Are U.S.-Born Offspring of Immigrants.” Washington, D.C.: Pew Hispanic Center (May 2009).